Ideal Tax Solution, LLC is reaching out to employers interested in receiving tax relief when reclassifying their independent workers as employees. The IRS has modified its eligibility requirements making it possible for more companies to apply for this program. Knowing what changes the IRS is implementing is extremely important. Ideal Tax Solution, LLC works with individual and business taxpayers alike to provide comprehensive tax help services. IRS announcements regarding any modification to existing tax regulations is thoroughly analyzed and then prioritized as part of an inclusive approach to providing up-to-the-moment tax information. This information can prove vital in accurately assessing an individual or company’s tax liability. Nearly 1,000 employers have applied for the VCSP thus far. Businesses, tax-exempt organizations and government entities may apply. The program provides partial tax relief from federal taxes for employers who treat workers as independent contractors or non-employees, and now wish to classify them as employees. Ideal Tax Solution has advised many companies on the beneficial aspects of different worker classifications. Employers accepted into this program will no longer be subject to a special six-year statute of limitations, rather than the usual three years which normally applies to payroll taxes. And, under the revamped program, employers under IRS audit, other than employment tax audit, can qualify for the VCSP. These and other permanent modifications to the program are described on the IRS.gov website and can be explained by contacting Ideal Tax Solution. An employer must be currently treating workers as non-employees to qualify for the VCSP. That means workers in the past have been consistently treated as non-employees, including the filing of 1099 forms. Employers must also not be under audit for payroll tax issues by the IRS. Additionally, an employer cannot be under audit by the Department of Labor or a state agency. 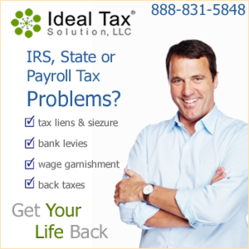 The tax-relief specialists at Ideal Tax Solution can help determine a company’s eligibility status. Interested employers can apply for the program by filing Form 8952, or by contacting Ideal Tax Solution. Applications for the VCSP should be made at least 60 days prior to the desired date for worker reclassification.